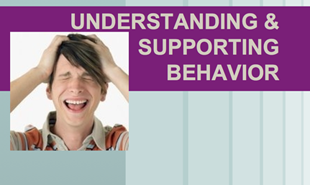 How to help people change ineffective and inappropriate behavior using positive approaches. Provides a background to understanding why people behave in certain ways, the communicative intent of behavior and how to help people change ineffective and inappropriate behavior using positive approaches. This course provides core concepts related to how behavior relates to environments and the problems with labeling behavior without fully understanding its communicative intent and the context in which it occurs. Besides reviewing basic reinforcement principles, it points out the specfic issues with using punishment as a behavioral control technique. IT also covers innovative strategies on influencing behavior in the natural setting through restructuring, redirection and relationships. Includes downloadable and reproducable forms. Also a downloadable notes page that follows the presentation.